Maybe you have already seen some of those fancy enclosures people build for their printers. How do they work? And do they work? Today, we will shed some light on this matter! Plus, we are going to dive into patent wars and explain why not all printers come with an enclosure. 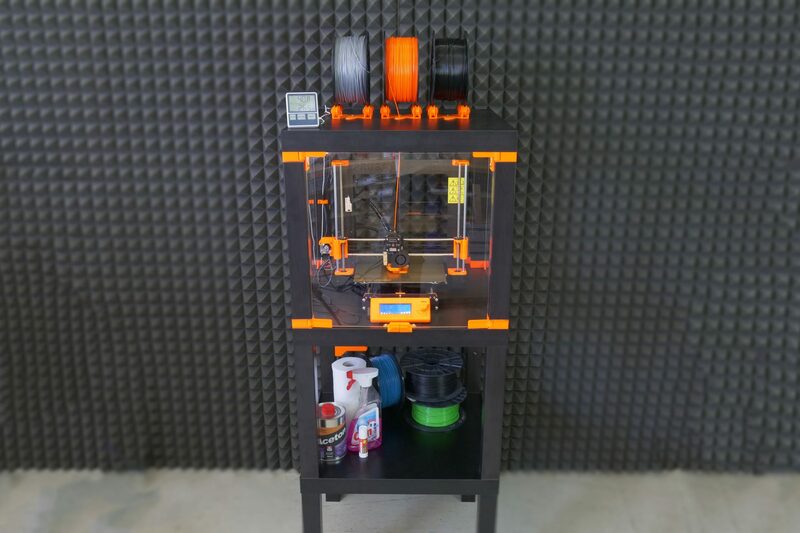 To top things off, we will even give you a full guide with information on how to build an enclosure for your own printer. But first, let’s start with the fundamental question: what is it good for? Stable printing environment – Drafts can negatively impact your print. An enclosure will keep the temperature stable and high. 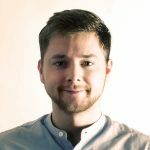 Big differences in ambient and printing temperatures can lead to warping and shrinking of the printed object, especially when printing with ABS. Layer adhesion may also improve with higher ambient temps. Reduce and contain smell – Some filaments (looking at you, ABS!) can release unpleasant fumes during printing. An enclosure will contain these fumes, and you can quickly vent them outside through an open window when the print finishes. Noise reduction – As if you needed the MK3 to be any quieter 🙂 But another level of sound isolation can’t hurt, especially if you place the enclosure next to your work desk or in a living room. Dust collection – The bearings and smooth rods will appreciate the reduced amount of dust that settles on your printer. However, if you’re not printing with ABS or other high-temperature filaments that suffer from warping, you won’t see much of a difference. You might actually want to keep the enclosure open with, for example, PLA to ensure there’s enough cool air around the printer for the part cooling fan. Why aren’t all the printers on the market enclosed by default? There are two factors here – price and patents. There is no doubt that the rise of consumer 3D printers was delayed by patents. Companies like Stratasys, Zcorp or 3D Systems have patented nearly every 3D printing technology you can think of. It’s pretty crazy when you look at the sketches from 1980s-1990s and realize just how much some of the current 3D printers are similar to them. It was only after these key patents expired in 2009 (20 years after application) that the RepRap movement started. And cheap, easy-to-build 3D printers quickly started to be developed. Even though most of these basic patents have already expired, some of them (most importantly the ones owned by Stratasys) are either still active, or have just recently expired. For example, Stratasys’s (still active) patent describes an apparatus “That builds up three-dimensional objects in a heated build chamber” (…) “The motion control components of the apparatus are external to and thermally isolated from the build chamber.” That means if you put the stepper motors outside of an enclosure, you can’t sell the product, as it would violate the patent. Another obstacle is the price. We have considered and even developed a Prusa enclosure quite a while ago. It was made mostly of Plexiglass. Our target was $90 price tag and considering the packing, shipping and material cost, we just couldn’t make it work. It makes much more sense to build the enclosure yourself from locally sourced materials. How hot should the enclosure be and can the PSU stay inside? Let’s get something straight, we are not targeting really high temperatures inside the enclosure. You don’t need an extra heater. The printer itself produces a lot of heat and all you have to do is to not let it escape. The goal is to achieve stable temperatures without any sudden changes from wind or draught. Even just 35°C inside the enclosure will make a massive difference, increase layer adhesion and may prevent ABS from warping. The PSU is not made to work in extremely hot environments. By keeping the PSU in temperatures above 40-50°C can significantly shorten its lifespan. Ideally, you’d place the PSU outside the enclosure. You can even place the LCD outside to be able to control the printer without letting the hot air out. Using Ikea Lack as an enclosure is the most popular choice among the 3D printing community. If you search online, you’ll find dozens of Ikea Lack enclosure designs. The table can be bought for under $10 and has almost the perfect size for Prusa printers. You can stack the tables on top of each other to create bays for multiple printers, or use one as filament and tools storage. Even though some of the existing enclosure designs are pretty good, we wanted to give it our own spin. 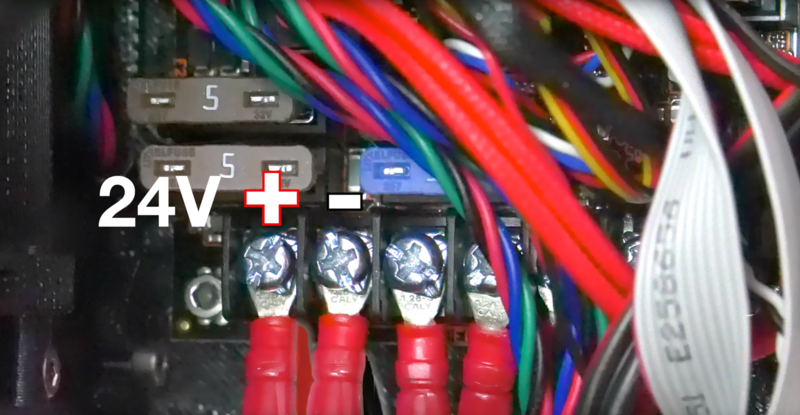 If you want to use a 12V LED strip with the MK3, use a separate power supply. D strip with a power supply, like this one. 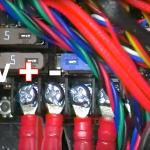 However, if you’re feeling a bit adventurous and have some experience with wiring up electronics, you can power the LEDs directly from the printers power supply. Remember, that the MK3 runs on 24V, whereas MK2/S runs on 12V, so make sure you buy the correct LEDs. 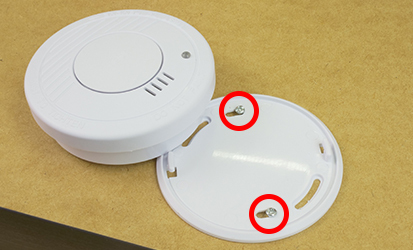 Place the smoke detector in the rear part of the table so it will not obstruct filament insertion or won’t get in the way when you’re taking the printer out from the box. Before you start screwing the bottom standoffs, make sure you place the Plexiglass in first. As soon as you tighten the standoffs, the Plexiglass will be fixed in place, and you won’t be able to remove it. This means you can easily lift this section of the enclosure without worrying that the glass would fall out. Note, that one of the four standoffs has a hole for cable pass-through. Make sure you place this standoff on the left side so that the cables can be routed directly to the EINSY board. Electronics do not thrive in higher temperatures inside the enclosure. To preserve PSU in good condition, it’s better to place it out of the box. It is even safer! Disconnect the cables from the EINSY board. Do not forget to unplug the Power panic sensor as well. Unscrew the PSU form the frame. Hold the PSU next to the rear left leg (the one with the cable pass-through). Tighten the PSU holder printed part with two screws and then install PSU catcher printed part. PSU is now fixed, but it is possible to slide it out when you need it. You can replace the PSU on the frame with this printed part to ensure the rigidity of the frame. After removing the power supply from the frame, it’s possible to replace it with a printed part and ensure frame stiffness. The heatbed cables may hit the plexiglass in the back of the enclosure. To prevent this from happening, print an alternative 60 degree heatbed cable cover. (EDIT: Users reported several problems with the right angle one shown in the video and on the pictures below, so we switched the suggestion to the 60 degree one). Fix the four bottom plugs. One of them has a hole for cable pass-through. Place it in the rear left corner of the enclosure. 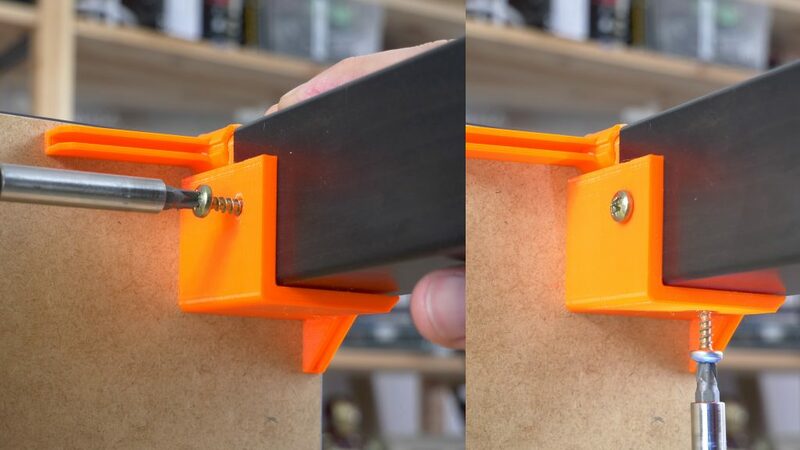 Glue two magnets to the door stopper and screw it to the front of the table. Leave enough space for the plexiglass and the handles (1 cm). Now just stack the two tables on top of each other and the enclosure is complete. Optionally, you can add another Ikea Lack table to the bottom to raise the printer to a more comfortable height. I am wondering about the electronic card (Rambo mini). Is it fine at 40 50 degrees or it would be better to bring it outside like the PSU ? I am having the same interrogation, does somebody has an answear? 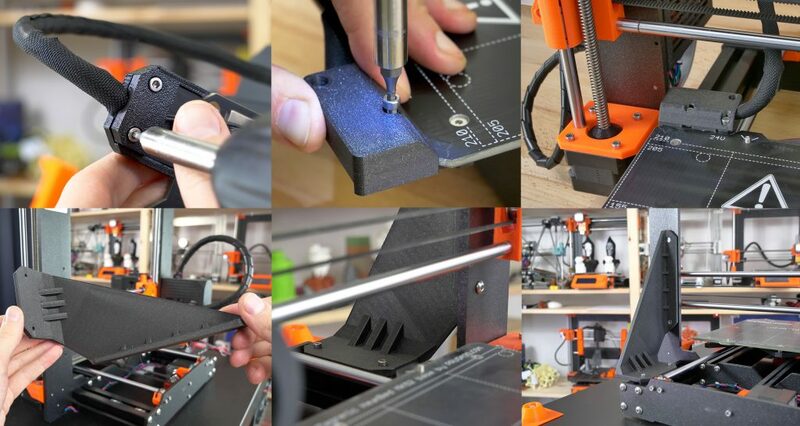 Be aware, with the ‘default’ Prusa software settings of 0.15mm build height and 20% in-fill, the entire kit of parts will set you back the better part of 40 hours to print! Excellent article! Does this Lack enclosure support the MMU v2? The encloser looks amazing indeed. Regarding the MMU 2.0, I would be interested to know the answere as well. I would also like to know if MMU 2.0 will fit. Same here, would it fit and can you still put spool holders on the top of that table with mmu 2.0? You guys (to all of you in this MMU 2.0 thread) are obsessed with the MMU 2.0 😀 If you order the MMU 2.0 now, chances are you’ll get it no sooner then by August or September, as stated on the product page. That’s like 4 months from now. By that time the files for the enclosure might look completely different, we keep updating them as we keep finding places of the enclosure to improve. For example, Dominik has just changed the spool holders to be adjustable in width to take any spool size 🙂 We’ll upload it as soon as we finish testing it. Yes, probably the files will be different, but i do not want to get the plexiglas in the wrong size…so the question is if the height of the enclosure is sufficient to use it with the mmu 2.0.. Exactly. I’m fine waiting for the MMU 2.0, not fine with paying $80 for plexiglass twice because it won’t fit. If you know it will fit, let us know and we can order our plexiglass and enjoy the enclosure now. If it will not fit, we can wait for a new design before spending money on a four month enclosure. The PTFE tubes that carry filament to the printer point upwards before descending. You could force the printer under the top table, but that would interfere with the flow of filament. Also, this design assumes that the filament is delivered to the printer from the top down, whereas the MM unit delivers filament from underneath the extruder motors, which doesn’t fit this design. My plan, which I will try over the next day or so, is to have the printer sit on top of the top table, and then have the filament on the table below, using the filament rollers provided with the printer, but pointing backwards so the filament travels around the back of the tables. I *think* this will work. Another adjustment I made (but not MM related). I bought three tables, but the overall effect was rather overpowering, visually. So I took the bottom table and sawed off the legs to make a 10cm ‘stand’. What totally surprised me (but is obvious in hindsight) is that the legs are hollow, so I needed to put something underneath the bottom table legs when it sits on the floor. Nice. I personally use a Ikea Stuva cabinet with a Besta Sindvik door. The printer fits nicely sideways when detaching the display. That’s my set-up x 2 and it works well. I added some eva foam floor mats to the floor to help reduce the vibration and I have some thin metallic ‘bubble wrap’ insulation just in case. I’m thinking of adding some reptile heaters and independent temperature controllers to help regulate it. The only thing of caution with any enclosure is that you are more likely to be printing ABS, which has fumes. It may be woth looking into building a air scrubber using some of the removable filters from an air respirator – plans available on thingiverse. Compared to $8.00 each for the Lack Tables, $100.00 for the Ikea Stuva cabinet with a Besta Sindvik door, makes them very expensive. The Lack Tables also give you something to build and modify if you desire and a very low cost. Couple of questions though, is it possible to add another spool holder, seeing as the multimaterial upgrade can use 4 different filaments at once? What would the measurements of the spoolholder spaceing be then? Also, is any fire detector usable? Or are there special ones for 3d printing? Will a “normal” succesfull print using PLA or ABS trigger the alarm with its fumes? We used just a normal smoke detector 🙂 And it didn’t trigger even after many hours of printing ABS. And as far as the filament holders go, imagination is really the limit here. You could create either 5 holes on top for 5 filaments or for example create a continuous couple centimeters wide slot in the top. Then you can use the stock filament holders that you get with the MM upgrade or any other spool holder you come up with. Is the screw size no 6 screws or 6mm screws (no 12)? Also certainly in the UK 2mm thick neo mags are tricky and all seem to be 1.5 I imagine at that levels it won’t matter particularly. And as far as the magnets go, 1.5mm might even be better, the ones we used are super strong, almost too much for the glue that holds them. Mikolas Zuza, great build. Can we have the original models? The STL files contain too many parts and are bigger than my build platform. This looks like a very well thought out enclosure. I’d like to build one, but living in the US I have to convert to the illogical system of measurement for sourcing materials. The nearest Ikea to me is about 150 miles away, but it looks like they sell the Lack side table through their web site for $8 each. Shipping to me is a flat $9 if I order either 3 or 6 tables. 3mm thick plexiglass is labeled as 1/8 thick here, even though the actual thickness is 3mm (0.118″). Plexiglass here is sold in 1-ft increments, which works out well since 440x440mm is just under 18×18 inches. The local hardware store has a 36″x72″ sheet for $75 which would make 2 enclosures. I see a 2-pack of 24″x36″ sheets on Amazon for $35 with free shipping, enough to make one enclosure. Or to avoid any cutting, TAP Plastics will sell cut-to-size pieces for $40 + $20 shipping for the whole set. Could a link be provided? I’m having a Devil of a time trying to find Plexiglass that isn’t over $40 a sheet. I found Tap Plastics as well and they seem to be willing to cut things to spec. Here are the magnets that I sourced. I haven’t received them yet, but they appear to be the correct size. Going to try the 20x6x1.5mm magnets from GuysMagnets dot com. I tried replacing the IKEA lack screw that where originally install with #12 x 2″ but they would not secure tightly. A larger diameter screw, closer to the original lack screw diameter, would be better. You can also try filling in the holes with some wood filler or plug the holes with some scrap wood to get a tighter fit. Also if you cannot find #12 x 3/4″ for the smaller screws, #10 x 3/4 would work well too. I used toothpicks and a dab of wood glue.. I ended up using #14 x 1 3/4″ screws for the upper corners and they worked perfectly. My local Lowes was out of #14 x 2″ so I decided to try the slightly shorter ones and they worked fine. I think the material list in the directions should be updated to #14 x 2″ since they are the proper diameter. I think the $35 plexi 2 pack you found on Amazon was .03 mm thickness not 3 mm. not the 1/8″ or 3 mm. That 2 pack is $50. James, this was super helpful! Thanks a lot for pointing me to TAP plastic. This saves me a ton of time and effort. Thinking about building one of these, it occurred to me that a 4th table added to the stack and also enclosed with plexiglass could perhaps serve as a dry box for hygroscopic filaments. You already have the filament holders positioned on top, so this seems like a pretty minor change. Do you think this would be useful, or are the gaps around the edges of the plexiglass too loose to keep humid air out? I was thinking about it too. The gaps are imho too big to keep the humidity out. They are there on purpose in order to avoid reaching way too high temps. That said, I can imagine it would be easy to either place one of the Ikea Samla boxes that people use as dry filament storage on one of the floors of the Lack enclosure stack. Or maybe sealing the gaps with a silicone or something like that. But that would probably make it so that you can no longer separate the two tables. Not trying to be “that guy”, but I think it is super cool that you, as a company, though about selling an enclosure but then chose to design a really well thought-out version that you then offer freely to everyone. I have so much respect for this, thank you very much. 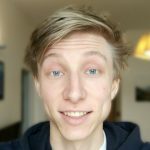 Is it possible to get the source files? I only have 4mm plexi and it‘s already cut to the right size. Why STP, I’m an OpenSCAD programmer and would like to be able to modify the files. I’m also a Linux user, so limited in access to several CAD programs. I’m in the same boat, I can’t use the Frame Brace replacing the PSU on my MK2.5. I want to know this also. Have the MK2.5. Printing and sourcing all stuff for this right now. Too bad there is no ikea supplier where I live. Would it be possible to get the scad files? I’d like to use the 8x3mm magnets left from my extruder visualizer . Would you please provide the file for the spool holder? How is the vibration on the 2 lack tables? I’ve been using a paver stone (1.5″ thick) to get rid of any vibration and has worked well for me so far. Though the files as is, I had to play with the Z-axis scale on the individual corner pieces to get a height that would compensate for it. I am wondering if I should be go with the stone in the enclosure or not. Any risk of the frame brace softening up in the enclosure if it’s printed in PLA? The inclusion of the smoke detector is causing me to wonder if building an enclosure significantly increases the chance of a fire. Is this indeed a significant risk increase or are you being extra careful? We’re just being extra careful. We hooked the LEDs to the printer’s PSU and there’s nothing wrong about that, but the user could possibly make a mistake at this step, short the board out or something like that. So we thought having a smoke detector in really can’t hurt. I’ve updated the article, so the same picture from the video is now in the LED section of the article. Is there a smaller version of the spool plate to fit thinner spools? Thanks in advance. You rock. Thanks for getting that up so fast. It’s really cool. But, it doesn’t look tall enough for the MMU 2.0 upgrade. Hello, could you give me the measurements of the wood of the table? so I make them; I do not have access to an Ikea LACK. Thank you. Sorry for my bad English. I am from Argentina. It would be nice to find these tutorials as other information in Spanish. 1) I’m getting an internal temperature (measured at the top of the enclosure) of about 20 degF (7 degC) over ambient. This is a designed, without trying to fill the gaps between the plex and the frame. 2) For us US types, #12 screws are slightly too small. 1/4″ would be better. 3) After cutting the Plex it may relax so that it is not perfectly straight. If it bows, make sure the bow on both sides of the doors match. 4) If you are just putting the enclosure on a desktop (see pix below) all the cable lengths are already long enough (just). Thank you for all the work – looking forward to building this out. One question as I haven’t started printing, but do you think the enclosure brakets are stong enough to hold 3mm (1/8″) glass vs plexi? Thinking of using glass as a less cost / better noise suppression – I can get the glass cut ~$44 USD. It should be strong enough to hold it. That said, normal glass is way more fragile, so watch out for that. You could probably get away with thinner glass and just something to fill the gap between the printed parts and the glass. Had to redesign the placement of PSU. I had to put it on left back leg instead of right wich ment so redesigning of some parts. Because my cable from PSU to einsy board was so short it barely made to its original placement on mk3. Has anybody else tried running XYZ calibration with the new heatbed printed part? Mine collides with the cable bundle during calibration, with so much pressure that it flexes the bed and the printed rods. I strongly recommend against using this until someone from Prusa can weigh in on this. Could you please describe a bit more which 2 parts collided with each other? I passed XYZ calibration just fine, I also ran over 48h long test where the bed violently goes back and forth to ensure this part won’t break the cables. I have this same issue. During the setup wizard it will crash into the right angle connector on the back left corner. It also bends the bed. I had to remove the cover to be able to complete the calibration. After calibration was finished I put it back on but there is hardly any clearance on the back left calibration point. Oh God, so I wasn’t the only one. On the Mk3 I was unfortunate enough that the jagged edges of the middle screw hole absolutely ruined the textile sleeve on one of the heater cartridge wires. Be very careful with this part, file it down well before installing it. I raised my cable bundle as much as I could – I had to remove the zip tie that held the cables together from “factory” to achieve a better fit. It still touches but not violent enough anymore to move the bed. I would add this info the blog post. That part is just too tall, I thought about trying to cut it down in Meshmixer but I haven’t gotten around to it. OK, I know believe this is also related to the original firmware that is shipped with Einsy. If you update to 3.2.0-RC1 from github then the XYZ calibration process is different(has been since 3.1.4 according to changelog but the download page gives you the 3.1.1 version). With this new process it seems to not ram so hard into the bed. Scheduled as next weekend project. Is there a glass plane on top of the tabletop right under the printer ? Reffering to the last picture of the picture group shown at PSU holder. No, there isn’t. But it kinda looks like there is, right? The table is really glossy, so it mimics the look of a glass on top a little bit. This is wonderful, I’ve been looking for a sleek version of this, and it blows so many out of the water with all the tweaks you’ve made! I’m wondering if it is possible to make latches of some sort to hold the top more secure until you are ready to remove the whole piece or if it is necessary. I’m primarily building my enclosure to keep the MK3 and my cat safe from each other, and he’s likely to jump on the very top of the case despite what I do. I’m still very new to printing, so I’m not sure how I would go about designing something. Any tips or help would be very appreciated! So this place has AWFUL reviews – all 1-star reviews on their Facebook page of people never getting their order after months and no response from customer service at all…. Ouch. I ended up ordering these (1mm short on the width, so 20x5x2mm) from eBay – exchange rate to USD wasn’t bad at all. Ordered two sets, one for myself and a friend and shipped them together. Made and extra edition to the enclosure. I ended up buying my plexiglass cut from Liard Plastics in the US – they have locations all over so you might get lucky and have one nearby. I’m picking it up in a day or two and it only cost me $42.40 for the material and the cuts all together with tax out the door. I am receiving my 1st 3D printer in a couple of weeks (so MK3) but have the MMU2.0 also ordered. In order to help me waiting, I wanted to get started with some of the orderings (Ikea, plexi, magnets, …) but I don’t understand yet what would be the modification required for the MMU 2.0. How can the 5 spools and the MMU fit on the top and is the length of the tube long enough to cope with the table extra width? Any picture or more precise explanations would be fantastic. I’m really sorry, that’s my mistake 🙁 I was hunting for the cheapest one and I missed that it’s 40×40 instead of 60×60 🙁 I fixed the links now. The dimensions for the plexiglass are not 18” x 18”. The corrct measurement is 17.323” x 17.323” and for the doors is 17.323” x 8.66142. Unfortunately, I did not do the conversion before I had the plexi glass cut and took it for granted the 18” x 18” was the correct size. – First, the right angle heatbed cable cover for the MK3 causes that the extruder wires crash with the heatbed wires. So it requires use the original cable cover for the heatbead at calibration point number 9. – The PSU cables are too soort and the oposition of the printer inside the enclosure is bottom left. This causes that the heatbed cable crash with the bottom metacrilate pannel. The only way to fix this problem is make a hole with a grommet and pass the PSU wires trought it. Many of the printable parts use PET,, Can i Replace those with PLA? Really nice, i’m on it !! But why do you use a 3mm drill and a 10mm. Is that diferent hole, or just a dredrilling to avoid some problems ? Hi, thanks for your efforts here. I’m anxiously awaiting my new printer from Prusa! Can you give me an idea how much filament is needed to print the Lack Enclosure Main Parts? I made https://www.thingiverse.com/thing:2890592 “Prusa i3 MK3 60 degree heatbed cable cover” since the one linked in this article (https://www.thingiverse.com/thing:2837970 “Right angle heatbed cable cover for the MK3”) will damage the extruder cables in case the hotend is moved to the upper left corner. If you like it you could recommend that one instead (I have read that some people have already damages their extruder cables). Are there separate STLs available for the variable width Spool Holder components please because when I print the base slide assembly it always prints stuck together, and I can’t separate the parts. 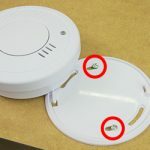 Can you advise a specific model smoke detector (NL/EU area)? Bought one in the local shop but manual states operation temperature must be between 5 degrees and 38 degrees Celcius which obviously makes it useless in an enclosure like this. Been searching for an hours or so but only found 1 sofar that seems to do the trick temperature wise (Hagar TG600AL) but unfortunately that one needs to be mounted 50cm or more from each side…. Do you have separate stl files for every piece of the table? Do you have a link to the “PSU Holder” part? I can’t seem to find it on this page. Thanks! Is there a fix for the mk2s power supply? The bracket that holds the mk3 power supply won’t work since the mk2s power supply has the cables coming out of the top instead of the back. Just built this. The PSU Wires are NOT long enough. I have them as tight as possible and it still isnt good. The 60degree bracket will hit the plexi. If i switch the the 90 it might work but it leaves the psu wires under constant stress. I have an MK3 and the PSU cables are too short? Has anybody found a solution?